May 29, 2017 by bethmcgaw in Blog | Comments Off on Toss Your Caps in the Air! It’s graduation time again! 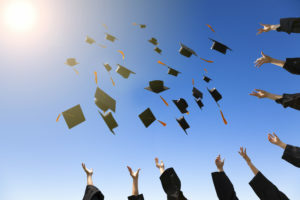 Many proud parents will be watching their high school senior walk across the stage to receive their high school diploma. It is predicted that 1 in 5 of those students has learning disabilities* and 1 in 6 with ADHD*. NEWSFLASH! Learning disabilities and ADHD do not disappear after graduation from high school. 41% of students with learning disabilities will complete college compared to 52% of their peers without learning disabilities. 24% informed their college they have a learning disability. 7% did not inform their college even though they still considered themselves to have a learning disability. 69% did not inform their college because they no longer considered themselves to have a learning disability. For the student who is college bound, would the success rate increase if more students informed their college they needed help and used the accommodations they are eligible for? I believe it would and I have seen it happen first hand. Students will struggle to the point of failing if they deny themselves the opportunity to succeed by not self-advocating for themselves and using services such as tutoring, note takers, digital textbooks or the option of working with a learning specialist. Also, many factors that are not academic get in the way of success. Organizational skills and independent living skills are tested beyond the maturity of the student and can hijack the experience for both the student and parent. However, once they consistently start using the services available to them, grades and self-confidence increase as well. It is imperative that we deliberatively teach our students these skills prior to leaving for college. But if the student is showing that they are not ready there are options. Enrolling students in a gap year program focused on helping the student learn more about themselves and independent living skills can be beneficial. Enrolling in a summer program focusing on the transition process before going to college can also be beneficial. Attending a local community college and working a part-time job may also provide the year of maturity that they may need. Remember that after graduation the support of the school, IEP and teachers are gone. No second chances on tests, no projects turned in late for a grade. If a student stays home after graduation to attend community college, parents have to play a larger role in guiding their student when these supports are no longer offered. A typical Disability Support Services Office at college doesn’t normally offer personalized service. They will help to put the accommodations in place but then the student is left on their own to navigate the system. In that case, I suggest hiring a learning specialist to guide the student in acquiring the self-advocacy and organization skills needed to succeed on their own. Some colleges offer Comprehensive Learning Support which also can provide the personalized support. High school graduation is a major accomplishment and I congratulate all the graduating seniors and their parents. It is an exciting time. Launch Pad Consulting Group can assist with all aspects of helping your student embark on the next journey of their life after high school. Contact us and we will walk through it together. 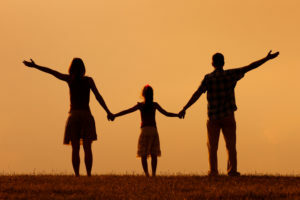 Family enjoy in sunset together. As a parent there are decisions that I wish I could have made, would have done or should have done. There are definitely decisions and choices in life that we look back on and wish we had done differently. If only I had tried that therapy, changed schools or did more research. But if we hadn’t made that decision then we wouldn’t have learned from that experience that led to the current outcome. Who knows if that outcome is the decision I should have made in the first place which created a more resilient son helping him learn how to deal with rejection later in life. It is inevitable that our children will grow up to become adults. And for the most part be independent enough to live on their own. I know some of us have a hard time letting go because we have done so much for our children and we are afraid they can’t do it on their own. It is difficult to watch our kids fail. But don’t think of failure as falling down but failing up. Our job as parents is to lead them on a path towards being responsible and independent. The decisions we might regret are all part of the learning experience for you and your child. To help support me on my journey I turned to the Learning Disabilities Association of Georgia, a state affiliate of the Learning Disabilities Association of America. I found myself getting more involved, meeting other parents in my situation and connecting with professionals. I then got more involved in the LDA and now serve on the board of directors where I have been privileged to meet other parents going through similar journeys and professionals who have guided some of my decisions. Most of all I have made lifelong friends. So the next time you start thinking, “I could’ve, would’ve, should’ve..”, think back to what you learned from that situation and move forward with confidence. Seek out others to guide you when you have questions and know you are doing the best job possible given each situation. 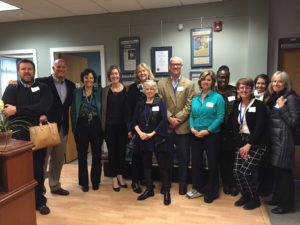 In May I joined a group of independent educational consultants and toured five schools/ programs in two days along the beautiful Connecticut shoreline. While each serve students with individualized needs they each do it in a very different way.